The Imperial Valley grows much of the nation's winter vegetables, and the irrigation district also serves several cities. 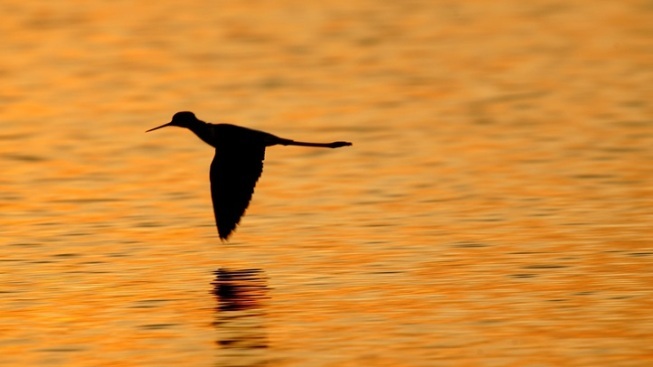 A black-necked stilt flies before dawn on October 20, 2005 in Salton City, California. A California irrigation district with the highest-priority rights to Colorado River water is using its power to demand federal funds to restore the state's largest lake, hoping to capitalize on one of its best opportunities to tackle a long-standing environmental and human health hazard. The Imperial Irrigation District wants $200 million for the Salton Sea, a massive, briny lake in the desert southeast of Los Angeles created when the Colorado River breached a dike in 1905 and flooded a dry lake bed. The money would help create habitat for migratory birds and suppress dust in communities with high rates of asthma and respiratory illnesses. The district says that if the federal government doesn't commit to giving California the money, it won't sign off on a multistate plan to preserve the river's two largest reservoirs amid a prolonged drought. "There have been various plans over the decades for the Salton Sea, and none of them have been built," said Michael Cohen of the Pacific Institute, who studies the lake. "This most recent effort is a huge priority." A nearly two-decade-long drought has drained Lake Mead and Lake Powell to alarmingly low levels. The seven Western states that rely on the Colorado River have been working on a plan to keep the lakes from being unable to deliver water at all. In the lower basin, the drought plan would mean voluntary and more widespread cuts for Nevada, California and Arizona. The plan has hinged at various points on the latter two states. The Gila River Indian Community, a key player in Arizona's negotiations, threatened to pull out of the plan if the speaker of the state House advanced a bill the tribe said would undermine its water rights. The tribe now says it has the reassurance it needs to provide much of the water Arizona requires to soften losses for other users in the state. Arizona as a whole, though, said it's moving at its own pace on more than a dozen agreements that need to be signed among water users in the state. The situation in California remains shaky. The state last year secured $200 million in a voter-approved ballot measure to work on the first phase of a Salton Sea plan. The plan would create thousands of acres of bird habitat and help control dust that blows through the Coachella and Imperial valleys, creating a health hazard for residents. No one expects to restore the Salton Sea to its former glory. In its heyday in the 1950s and '60s, the lake was a major recreation area, frequented by boaters, anglers and even Hollywood celebrities. It was fed primarily by runoff but has been evaporating more quickly since San Diego's regional water agency stopped sending it water. Inflow to the lake has decreased to 900,000 acre-feet annually, about one-third less than 15 years ago, Cohen said. An acre-foot is enough to serve one to two households a year. Any action taken through the drought plan to preserve Lake Mead on the Arizona-Nevada border or Lake Powell on the Arizona-Utah line must take into account the crisis at the Salton Sea, said James Hanks, who sits on the Imperial Irrigation District's board of directors. "IID has worked to be a good neighbor on the river," Hanks said at a recent meeting. "Yet, a sustainable solution to declining flows cannot and will not be attained at the continuous and severe expense of the Imperial Valley and the Salton Sea, while other agencies intend to grow their supply off of a shrinking system." The irrigation district has something else to gain from the drought plan: the ability to store huge amounts of water behind Lake Mead for later use because it doesn't have its own long-term storage reservoirs. The district is seeking a funding commitment for the Salton Sea ahead of a March 4 deadline set by U.S. Bureau of Reclamation Commissioner Brenda Burman for Arizona and California to complete work on the drought plan. Without a plan, Burman said she will turn to governors in the river basin states -- Arizona, California, Colorado, Nevada, New Mexico, Utah and Wyoming -- for a solution. But she said late last week she remained hopeful all the states soon will finish negotiations, and legislation implementing the drought plan will be introduced in Congress so it can take effect this year. The Coachella Valley Water District board joined other California water managers in approving in-state agreements earlier this month. But there's a caveat: Everyone signs the full plan or no one signs. Imperial wants to see the full package before it takes a final vote. Hanks said the Imperial board won't tolerate threats by the Reclamation Bureau, which has broad, unspecified authority over the drought plan. He said he doubted the agency could violate the priority system on the river. The Imperial Irrigation District is the largest single recipient of Colorado River water, with 3.1 million-acre feet of California's 4.4 million-acre entitlement under legal compacts stretching back nearly a century. Burman declined to talk about the Salton Sea funding on a recent call with reporters but said the federal government has been a strong partner in efforts to protect the lake. The land it sits on is a mix of state, federal and private ownership, but California has main responsibility for the declining lake under a 2003 landmark accord that quantified Colorado River water in the state. Bruce Wilcox, assistant secretary for Salton Sea policy at California's Natural Resources Agency, said the long-term goal for the 375-square-mile lake is that it's self-sustainable after it stabilizes around the year 2030. "Right now, the system we're building requires a fair amount of human intervention," he said. The Imperial Irrigation District recently wrote to the U.S. Department of Agriculture asking for the $200 million to be delivered through the latest farm bill, and those talks are continuing, the district said. Language in the bill made the Salton Sea eligible for federal funding for drought-related problems. California U.S. Sen. Dianne Feinstein also has been pushing the Trump administration to implement the provisions. Using the drought plan as leverage isn't without precedent. Earlier, southern California's Metropolitan Water District said it would be difficult to support the plan without another water source. The agency has pushed for two tunnels to be built under Sacramento-San Joaquin Delta in Northern California to ship water south. California Gov. Gavin Newsom said last week he would support one tunnel. Central Arizona farmers also have said they want a guarantee of federal funding for groundwater infrastructure they increasingly will rely on as they get moved off Colorado River water. "It's not just IID," Cohen said.